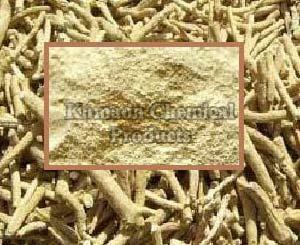 Ashwagandha or Winter Cherry or Indian Ginseng is a household name in the country. The plant is widely grown in North Western India and cultiÂ­vated in central part of India. It is an erect hoary tomentose unarmed shrub. Leaves petiolate, simple, stellatey, pubescent, oblong-ovate. Flowers sessile, greenish - yellow in umbellate cymes. Fruit two chamberred berry. Root 20-30cm. long with few lateral roots. Outer surface of the root is buff to grey-yellowish inner white-off white. Therapeutic properties of the root is attributed to the presence of the group of alkaloids and glycosides. The plant particularly, root is considered as tonic, aphrodisiac, alterative, astringent and sedative. The preparaÂ­tion prepared from th~ root,showed remarkable improvement in anxiety neurosis, improving concentration, fatigue, palpitation, tremor~ and anorexia. Withanolides posseses remarkable antibacterial and protective properties against Carbon Tetra Chloride induced toxicity.